Tiger and Dragon is an Asian-themed crossover between a classic video slot machine and a roulette game with no less than 1 million ways to score a big win around the table of 6 reels and 5 rows. Red Rake Gaming introduced its Accumulator Roulette granting Infinite Multipliers on Cascading Reels to help winners claim a jackpot of 20.000 coins. Read the Tiger and Dragon slot review and find out everything you ever wanted about this attractive title. Tired of reading? See the Tiger and Dragon screenshots below and then claim one of the bonus offers of our recommended casinos to play for free or real! Set in the Great Wall scenery, this is a game you can play for fun or for real money, just like all other titles produced in this studio. Surely, the Tiger and Dragon Free Play will grant you more than a few demo credits, so it’s up to you how to spend this gift: to master your winning strategy or to learn how to play without a real-money investment. In any case, your main task remains the same: try to form a winning combination with 3 or more matching symbols placed on adjacent reels from the leftmost. The series of blind guesses and wins is triggered with cash or demo credits with the total value between €0.20 and €35. The paytable is crowded with themed symbols of which the game’s logo has the highest payout rating and pays 70, 175, 350, 875 or 1.750 coins for combinations of 2, 3, 4, 5 or 6 of a kind, respectively. Various Chinese letters are the second-best choice that brings between 8.75 and 262.50 to your bankroll for combinations of 3 to 6 of a kind. Wilds can replace all other items but the Scatter and the Tiger and Dragon Bonus icon, which activates an additional element on the panel you need to fill up to claim some extra spins. Each time you form a winning combination, elements on the Bonus panel will activate, so try to get them all and enjoy spins at the casino’s expense. Also, 5+ consecutive respins may activate bonus games. The Tiger and Dragon Free Spins come with Infinite Multipliers that start from 1x and increase after each winning round. 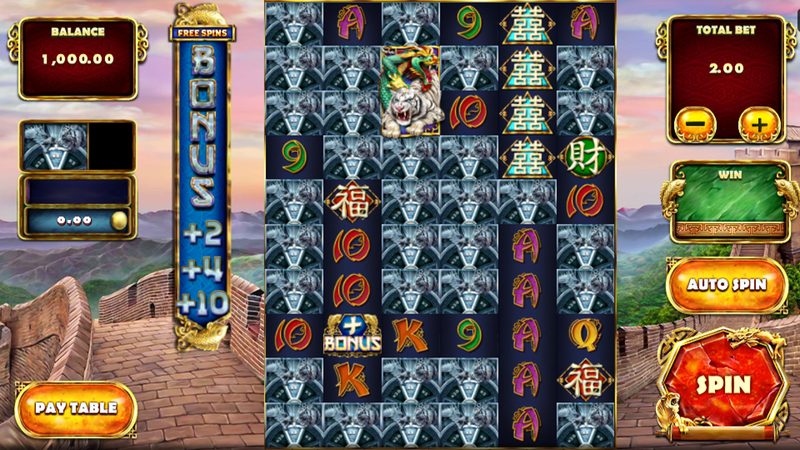 When you accumulate enough non-winning symbols on the Tiger and Dragon Roulette Panel and fill it to the maximum, you will activate a rewarding interactive mini-game. Choose Tiger or Dragon and if the ball lands on the color corresponding to your choice, see your winnings multiplied up to 200x. Also, the game ends when the ball stops on the opposite color. We have full mobile compatibility, meaning there’s no need to download an app for Android and iPhone in order to play online around sites powered by Red Rake Gaming. 3. What is the RTP factor of Tiger and Dragon? Our Tiger and Dragon tutorial will be updated as soon as we get the official RTP info. With reels cascading and leaving room for more winning combinations, sky-high multipliers and sizeable prizes on regular rounds, this is more than a rewarding game where you’ll definitely have to apply all Tiger and Dragon tips if your plan is to rise up from a foot soldier level.